Fans of NBC properties like 30 Rock, Parks and Recreation and Community with iPads will be pleased to hear that the network’s iPad app was updated to allow viewing of entire episodes on Thursday. GigaOM reminds readers that it originally called the app a “missed opportunity” when it debuted, due to the limited content unlikely to draw viewers in and a notable lack of sticky content like complete shows. But the network has repented, and in addition to programming information, supplemental viewing tidbits and schedules, the full-length episodes are now available to all iPad app users. 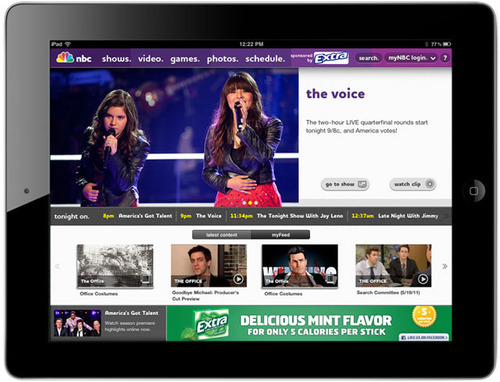 While the news is welcome to viewers, the newly-liberated content for iPad is unlikely to please another party- Hulu. The currently-for-sale video streaming company’s Hulu Plus service offered NBC content exclusively for iPad up until the update, and the change eliminates one reason subscribers might opt to pay extra for the service. NBC is not the first major network to loosen up about iPad viewing. ABC has offered the feature since the debut of the iPad in Spring 2010, but CBS content is only formatted for iPhone viewing.